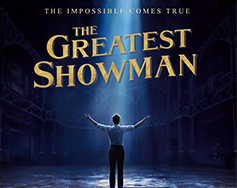 Join us at The Paramount Theater for a special sing-along screening of The Greatest Showman. Follow along with the subtitles and belt out the lyrics to the award-winning music. The Greatest Showman is an original musical inspired by the life of P.T. Barnum, starring Hugh Jackman. Barnum was a visionary who rose from nothing to create the “Greatest Show on Earth,” a spectacle and celebration of his larger-than-life imagination that captivated audiences around the globe. Also starring Michelle Williams, Zac Efron and Zendaya. Rebecca Ferguson’s voice was dubbed by Loren Allred. Ferguson had studied music and admitted that she can carry a tune but since Jenny Lind, her character, is considered the best singer in the world, dubbing her voice would be in service of the movie. However, in order to get into the role, Ferguson insisted on singing the song in front of the extras while filming. Hugh Jackman as "P.T. Barnum"
Michelle Williams as "Charity Barnum"
Zac Efron as "Phillip Carlyle"
Rebecca Ferguson as "Jenny Lind"
Yahya Abdul-Mateen II as "W.D. Wheeler"